Letters From A Tapehead: The Inbox Giveth: Locrian — Dort Ist Der Weg b/w Frozen In Ash 7"
The Inbox Giveth: Locrian — Dort Ist Der Weg b/w Frozen In Ash 7"
Chicago’s very underground noise metal juggernaut Locrian has been progressing with every album, cassette, split single and 7” they’ve been churning out since 2009’s Drenched Lands. The band (whose buzz relies on the combined efforts of André Foisy, Terence Hannum and Steven Hess) has been developing musically, not straying too faraway from their horror/freakshow environments but incorporating more and more composition into the framework. Their new 7,” “Dort Ist Der Weg”/”Frozen In Ash” confirms this development, but unexpectedly. The single begins with a cover of Popol Vuh’s “Dort Ist Der Weg,” its treatment a very Melvins-percussive and artfully post-punk approach. Lovely, near-droning vocals soften the band’s loose and jagged construct, which is set at a perfect trudge. “Frozen In Ash” takes the band’s expansive, sonic guitar loops and builds a rhythmic folk instrumental overtop. Acoustic strings appear, piano keys blare; it’s an odd combination of Locrian’s oft-alienating, noise experiments with musical knowhow, following screams with blues. 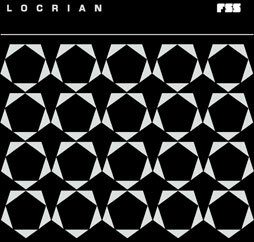 This sort of inventiveness within the band’s own identity is what makes Locrian a band that deserves attention, though it’s interesting that their most innovative work is turning out to be their most accessible.